Grindleford and Eyam Playgroup – set fair! The past twelve months has seen the playgroup in Grindleford change radically into a family focused, child centred place to send your child. Under the leadership of the management committee and the Supervisor Rebecca Stephenson, numbers have risen so dramatically that new staff members are needed! Extended opening hours, carefully considered routine and the fantastic forest school have all contributed to the changes, plus dedicated staff mean that it really is ,’a very happy place’ and ‘my child looks forward to coming every day’ say two of its parents. The Friday Mud Kitchen, is also a highlight of the week for many. Between the hours of 1000-1130hrs, mud kitchen toddlers operates alongside the normal playgroup session. This is an opportunity, for parents to see how things have changed for themselves in recent times. Plus eat toast,drink tea and meet other families! ‘My vision for playgroup, is one where children feel safe, secure and loved- so then they are free to get in with the serious business of learning through play’ says Rebecca. 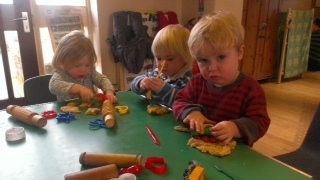 If you would like any further information about GRINDLEFORD AND EYAM PLAYGROUP please either contact the Supervisor on 07812425561 or use our contact form. This entry was posted in Uncategorized on February 21, 2014 by grindleford13.